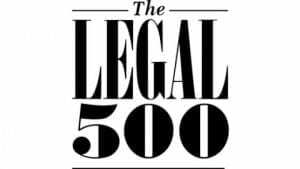 Tanner De Witt is delighted to be recommended again this year in The Asia Pacific Legal 500 Guide 2017 for its four main practice areas; corporate and commercial, labour and employment, restructuring and insolvency and litigation and dispute resolution. We are proud to announce that along with recognised leading individuals Ian De Witt, Robin Darton and Kim Boreham, solicitor Sunny Hathiramani has been selected as a new generation lawyer for our top tier Restructuring and Insolvency Practice. The full rankings can be found here. The practice at Tanner De Witt is led by Mark Side, who is acting for a high-net-worth individual in a professional negligence claim against an international bank. Jeff Lane is ‘a true market leader in fraud and asset recovery claims, with tremendous experience and local knowledge’. Lane is defending Yves Bouvier against a Russian billionaire accusing the client of defrauding him out of $500m. Pamela Mak is also a key contact. ‘An expert in the field of insolvency-related matters’, Tanner De Witt has a well-established practice and enjoys strong relationships with key insolvency practitioners; Robin Darton acted for the liquidators of OW Bunker in Hong Kong following the highly publicised collapse of the group. ‘All-round expert’ Ian De Witt is noted for his ‘practical advice’; he recently assisted a well-known Hong Kong-based company with the winding up of several entities. Among other headline mandates, Darton represented Kaisa Group during the complex restructuring of its offshore debt amounting to over $2.5bn. Tanner De Witt handles complex and sensitive employment matters for a client base that is divided evenly between companies and employees. The team saw an uptick in discrimination-related claims in 2015 and 2016; in one recent case, Russell Bennett advised a listed company on pregnancy rights and discrimination in the context of termination of employment. Recent instructions on the employee side include Kim Boreham’s advice to a former CEO regarding a high-value separation package.